Joseph Bartz is a Wisconsin native. His first private studies were with David Sawall(Glenn Miller and Tommy Dorsey Orchestras). His other primary teachers were Dr. Charles Isaacson and Joseph Stegemann, Hans Gelhar, and Christoph Schwarz. 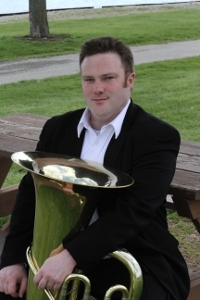 Joe studied Tuba, German, and Composition at the Universy of Wisconsin Oshkosh. After his studies in the US, he moved to Germany to continue his studies with Hans Gelhar, and earned his diploma from the Hochschule für Musik in Cologne in 2005. In October 2009 he completed his �Konzertexamen� with Hans Gelhar. While at the University of Wisconsin Oshkosh, he was awarded the prize "Outstanding Senior Composition Student" for his work during his time there. In Germany, he has recieved several commisions including a Duo for Bassoons �A Rainy Afternoon in Cologne� (2003); �Cloud Burst� a Viola Trio; and �Augen in der Großstadt� for Viola trio and speaker. His concertino for tuba has been performed in Germany and in the US, as well as his �Song without Words� for brass quintett. He has held temporary positions with the Gürzenich Orchestra in Cologne and the Symphony Orchestra in Düsseldorf. He has performed regularly with many of the orchestras in the Rhine/Ruhr area. In 2013 he released a solo CD �Impromptu� which has recieved good reviews from the ITEA Journal, and many of his colleagues. Currently, the CD is available digitally through spotify, iTunes, Amazon, and other download services. Joe also has performed regularly as a chamber musician with his quintets �Pentaphonic Brass� and �Die Sterne�, as well as with the Moerser Brass Festival, and has subbed with many of the other quintets in Rhine/Ruhr. His other intrests include Bujinkan, laungages, and Bonsai trees.